A mammosite balloon can lower your recurrence risk for the cancer. Studies have shown that this type of radiation therapy, delivered right to the location where the excised tumor was, greatly lowers the odds of the cancer coming back. These recurrence numbers went from around fifty percent down to twelve percent when radiation was added to surgical treatment. Whether you have papillary breast cancer or another type, a mammosite balloon procedure can allow you to lower the dose of radiation you receive. This is because the radiation is directed at the specific tumor location, so less is needed to do the job effectively. With a mammosite balloon you will not have radiation side effects in a large area. The radiation exposure is limited in area, so you do not see side effects over large parts of your body like with traditional radiation therapy. Is breast cancer curable? If radiation therapy is finished then usually the answer is yes, but convenience plays a part. Traditional radiation treatments last six weeks, and require a lot of inconvenience. This is not the case with this balloon procedure, which is shorter but just as effective. With a mammosite balloon procedure you are almost guaranteed to complete your radiation therapy. With the usual six week course between ten and fifteen percent of women drop out of their radiation therapy before they are done, because it is so time consuming and inconvenient. With this balloon treatment you will finish radiation, and have a much lower risk of recurrence. Breast reconstruction after radiation is essential for many women. 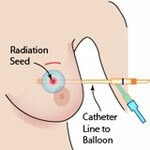 The mammosite balloon procedure only requires five days of treatment instead of six weeks. This means you can get your reconstruction done much sooner, and get your life back to normal. The mammosite balloon treatment can cost substantially more than traditional radiation treatments, and some insurance policies may not cover these costs on that basis. Part of this cost is that an MRI and Ultrasound are needed to ensure the balloon catheter is properly placed after the surgery.